Surrealism was an eclectic movement: on one hand, Dali’s works were dreamlike and fantastic; on the other, de Chirico painted pictures of strangely bizarre metaphysical vibe; Magritte, meanwhile, worked on paintings with ordinary objects in unusual contexts, and so created his own form of poetry to express his unconscious, in a more philosophical and conceptual way than the previous ones. The artist, unlike the other surrealists, was a disturbingly common person, always wearing a pilot, suit and tie; was married to his wife Georgette for 45 years without any scandal, and who promised her a “calm and quiet, bourgeois life. ” In short, a boring person. Golconda is one of my favorites. In the work, we see a composition in which a background of residential buildings is populated with men in hats. The landscape is similar to the neighborhood in Brussels where the artist lived. 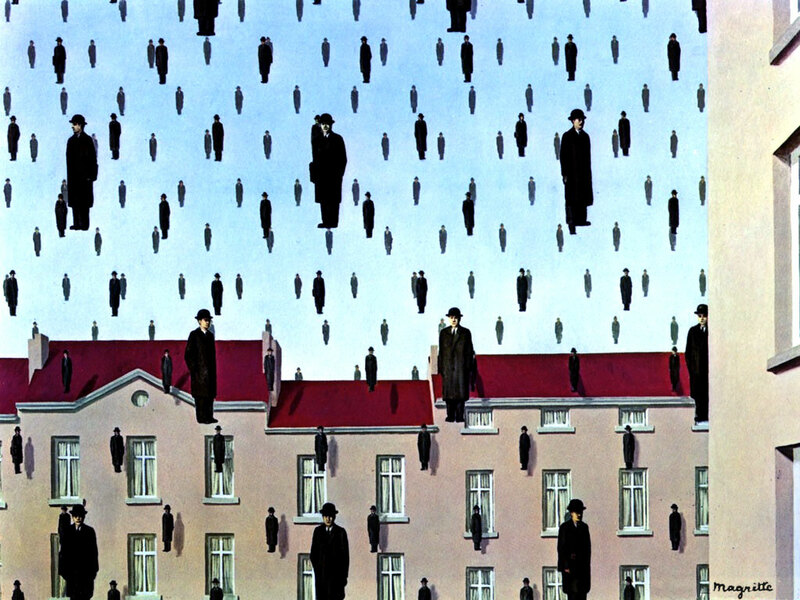 Although it looks that men are falling (which terrifyingly would prophesy the song “It’s Raining Men” by The Weather Girls), the characters are just floating there, since there is no visible sign of movement. The clothes the men are using was common in businessmen and bankers. The name of the painting refers to a city in India, renowned for its wealth, and was suggested to Magritte as a title by a poet friend who helped him to name other of his paintings. As a tribute, the artist portrayed his friend in the foreground man closest to the fireplace on the right. Both the reference of the name of the work, and the fact that characters can represent businessmen, tempts us to make an interpretation of the painting, but this is something the artist would reject completely. We are left only with the mystery and uncertainty, which makes the work darker and more attractive. ~ by Álvaro Mazzino on January 27, 2012. Hi. can you explained his meaning of above work “golconda”. Wow! In the end I got a web site from where I can really obtain helpful data regarding my study and knowledge. Chanel fans will find a lot to love here – beautifully detailed Classic Flap Bags, new spins on the Boy Bag that ranged from transparent PVC to extravagantly beaded white leather, whimsical clutches in the form of Chanel No. 5 bottles – much of it in the brand’s de facto team colors of black and ivory. Word came out that adidas was set to launch a new sneaker at the end of the year, which was supposed to be one of its biggest projects yet, but no one knew what it looked like. This entry was posted on January 27, 2012 at 12:37 and is filed under Surrealism.You can follow any responses to this entry through the RSS 2.0 feed.You can leave a response, or trackback from your own site.